Delivery points report a spike in heated canola. 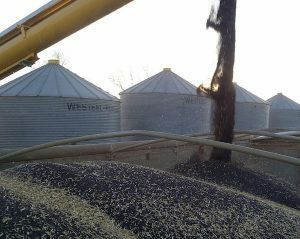 Check all canola bins as soon as possible. 2016 CPT small plot data posted! Small plot data from the 2016 Canola Performance Trials are now available in the searchable database on the CPT website and in the 2016 CPT small plot data booklet! 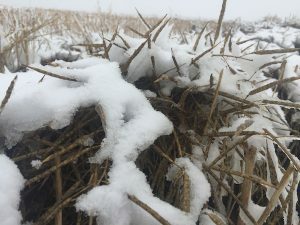 Weather is finally allowing for some harvest to resume across the Prairies, but the concern now is how to handle canola that could come off very tough, or damp. These steps will help improve conditioning results and reduce risk…. How do snow and winter affect canola quality? Canola harvested in the spring can have lower weights, lower oil content, higher free fatty acids in the oil and more animal excrement in the harvested sample, which could pose significant challenges from a feed safety perspective. Because the degree of yield or quality degradation is difficult to predict and likely depends on conditions, oilseed processors will assess the physical and intrinsic quality attributes and make a decision as to whether to accept spring-threshed canola at that time. 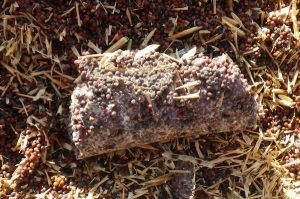 How do moisture, green seeds, weed seeds, hot canola and chaff increase the storage risk? Canola at moisture levels above 12% should only be stored in bags for three to four weeks, if at all, to avoid deterioration of quality. While the priority is on combining for many canola growers this November, please take time to check the storage situation for canola already harvested. The combination of warm weather and moist soils is almost ideal for losses. Growers may want to reassess the nutrient situation with a time-of-seeding soil test, then top-dress if amounts are less than expected. Given the warm temperatures and moist soil conditions, the ideal time for fall soil samples may still be ahead of us. For results to be as close as possible to the situation next spring, the ideal time to take fall samples is when soil temperatures drop below 10°C and as close to freeze-up as possible. Warm weather has some weeds showing and growing again. If weeds are green, leaf tissue is still relatively pliable and temperatures are relatively warm, growers may still have an opportunity to control perennial and winter annual weeds. The Canola Council of Canada (CCC) will hire three summer assistants — one each for Manitoba, Saskatchewan, Alberta — for the period April 26-September 1, 2017. 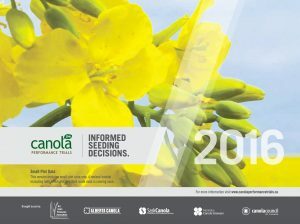 To accommodate this Canola Watch notice, the application deadline has been extended to November 18 from the original deadline of November 4, but note that the position could be filled before November 18. If interested, please don’t delay. Discussions at Canola Discovery Forum October 25-27 in Winnipeg generated an extensive list of research priorities. For those who could not attend, this is your chance to choose which priorities are most important. Go to www.menti.com and use the code “954068”. Check out the convention website for more information on the agenda, speakers, and evening events. Register by end of day on Thursday, November 10 for a chance to win a $500 VISA gift card. The November 2016 Canola Digest has been mailed. 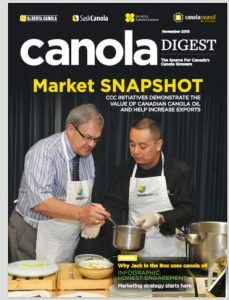 Highlights include lots of canola trade stats in “Canola market snapshot“, a feature called “Why Jack in the Box uses canola oil” and a new pull-out infographic called “Honest engagement” on how to talk science.